On May 8, 2007, The Milwaukee Brewers inducted 500 Home Run Club® member Eddie Mathews (512 career homers) into the Miller Park Walk of Fame. In the first year of voting, Mathews joined Warren Spahn as one of only two non-Brewer players to be featured at Miller Park, when each received more than the required 75% of the vote for election. The ballots included on-field personnel who wore a Brewers or Braves uniform for a minimum of three seasons, but had been retired from playing/managing roles for at least three seasons. Mathews’ family participated in an on-field ceremony, as the Brewers unveil the newest with home plate-shaped plaques on the Walk of Fame plaza outside Miller Park. Edwin Lee Mathews was born on October 13, 1931 in Texarkana, TX. His professional career began on the night of his high school graduation in 1949 when he signed with the Boston Braves. He chose Boston because he and his father determined they were the most likely to have a vacancy at third base in the next few years. They calculated correctly and by 1952 Mathews was Boston's everyday third sacker. He posted solid, very promising numbers, hitting .242 with 25 home runs as a rookie. He also holds the distinction of getting the last Braves hit in Boston, a RBI double on the final day of the season. The Braves headed west to Milwaukee for the 1953 season and Mathews adjusted quickly to his new surroundings. He became an All Star hitting a career high 47 homeruns and driving in 135 runs, while batting .302. He was joined by rookie Hank Aaron in 1954 and things came together for the Braves in 1957. While Aaron was on his way to winning the MVP, Mathews quietly hit 32 home runs and the Braves captured the NL pennant. Milwaukee defeated the mighty Yankees in a competitive seven game World Series. Mathews hit just .227 in the Fall Classic, but his 10 inning home run in Game 4 was the game winner and his backhanded snag of a Moose Skowron line drive sealed the deal in the ninth inning of Game 7. In 1959 Mathews returned to form, leading the NL with 46 home runs while driving in 114 runs and hitting .306. The Braves were contenders once again, but lost to the now Los Angeles Dodgers in a playoff for the pennant. From 1960-65, the franchises' last years in Milwaukee, Mathews remained productive hitting 39, 32, 29, 23, 23, & 32 home runs respectively. 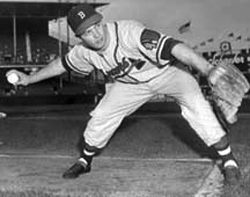 The Braves moved to Atlanta before the 1966 season, and Mathews became the only player to play for one franchise in three different cities. His production, however, dipped noticeably as he hit a career low 16 home runs. He was dealt to the Houston Astros for Dave Nicholson following the season - he had 493 career home runs at the time. 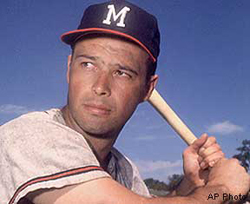 On July 14, 1967 Eddie Mathews became the first third baseman to reach the 500 home run mark, connecting off the Giant's Juan Marichal. It was about the only highlight of his short stay in Houston; he was dealt to Detroit in July. Mathews would hit only nine home runs as a Tiger, but did pick up his second World Series ring in 1968, his final season. 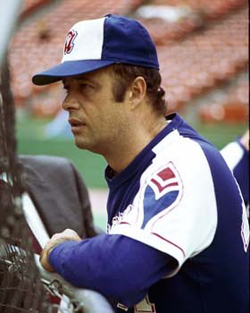 Mathews went on to serve as a coach for the Atlanta Braves during the early 70s and became manager in 1972. He managed the Braves the next two seasons, and was at the helm when former teammate Hank Aaron set the all time home run mark.